Shortly after WWII, a French soldier (Cary Grant) marries an American WAC (Ann Sheridan), but finds he must label himself a “war bride” in order to get into the U.S. with her. As noted by DVD Savant in his perceptive review, this “lightly amusing comedy” by Howard Hawks — based on Henri Rochard’s autobiography I Was an Alien Spouse of Female Military Personnel Enroute to the United States Under Public Law 271 of the Congress — has “probably… dated more than a lot of other 1950 comedies”, and requires an understanding of its geopolitical “context to become fully functional”. 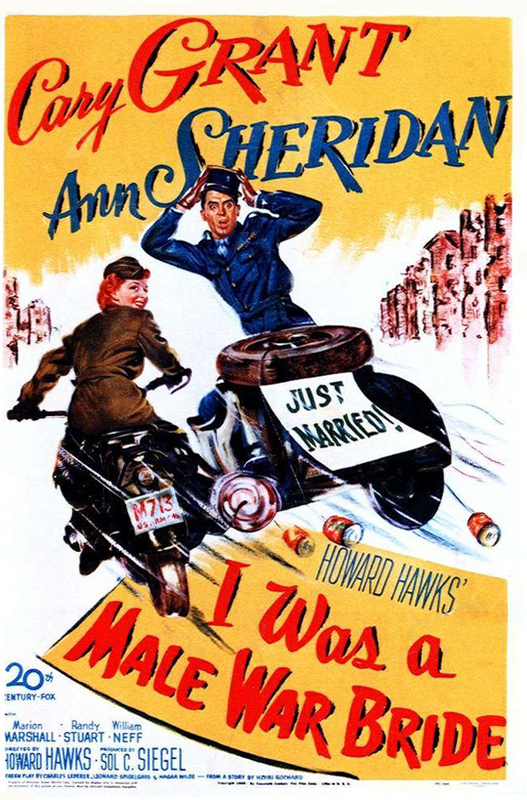 Its primary calling card is the image of Cary Grant in drag — but this only occurs for about 10 minutes late in the film; the bulk of the storyline (once quibbling Grant and Sheridan realize they’re a perfect romantic fit for one another) revolves around Sheridan’s attempts to get her new husband back to the United States with her, coupled with an ongoing “gag” about their inability to consummate their marriage. Fortunately, the script (by Charles Lederer, Hagar Wilde, and Leonard Spigelgass) keeps one engaged even when the premise itself starts to feel somewhat tiresome — and Sheridan’s feisty performance reminds one that she was an underutilized presence in Hollywood. But this one will primarily be of interest to Hawksian completists. Note: Interestingly, Peary nominates Grant as one of the Best Actors of the Year in his Alternate Oscars — though Grant never even bothers to attempt the requisite French accent for his Belgian character (! ), and his performance is really nothing special. No, but it’s recommended for one-time viewing. Listed as a Cult Movie in the back of Peary’s book.